We have compiled a list of questions that we are commonly asked by bystanders, survivors and families about cardiac arrest and CPR. If you have a question that you don’t see here, email us at bystandernetwork@gmail.com and we will be happy to respond and add it to our list! What is Cardiac Arrest anyway? A cardiac arrest is when your heart stops suddenly and without warning. This can be temporary if CPR is done or lead to death. A cardiac arrest is when the electricity in the heart malfunctions and causes it to beat irregularly. An irregular heartbeat means the heart can’t pump blood and oxygen to the brain and organs properly. Is a cardiac arrest the same as a heart attack? How common is cardiac arrest? Each year, over 400,000 people in North America experience an out-of-hospital, non-traumatic sudden cardiac arrest. Unfortunately only about 10% of victims survive a cardiac arrest. 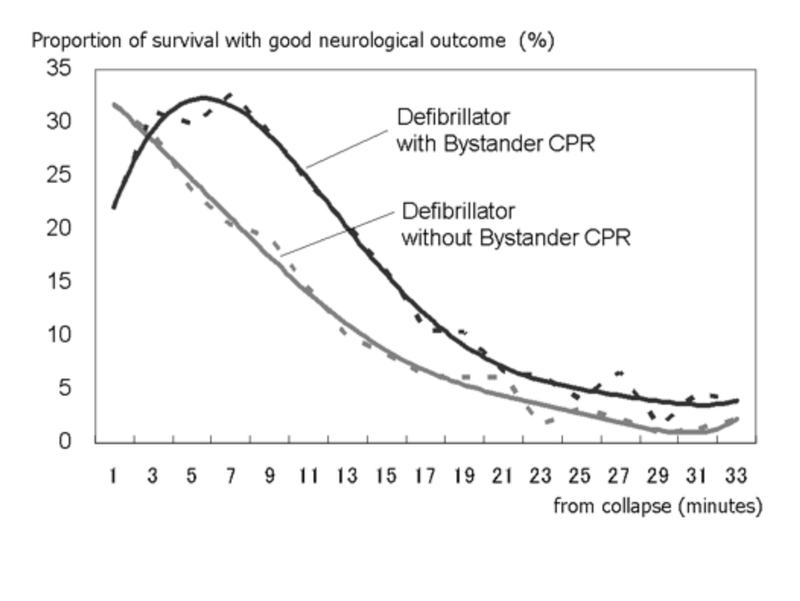 But the chances of surviving can increase 4x if bystanders attempt CPR before the paramedics arrive. The heart condition that causes sudden cardiac arrest can be genetic, yes, but it can be related to many other factors too. Medical screening is recommended for family members of a sudden cardiac death victim. If relatives of the deceased are thought to carry an inherited disorder that puts them at similar risk, preventive treatment options are available including drug therapies and implantable devices. What does a person look like who has had a cardiac arrest? They will be unconscious and will not be able to respond. They will be breathing funny – this is called agonal respirations or gasps (listen here - https://www.youtube.com/watch?v=pioQSVEUpP0). This abnormal breathing pattern is the body's attempt to breathe after the heart has stopped. Their lips or other skin may turn blue as well because their tissues are not getting enough oxygen. Cardiopulmonary resuscitation, commonly known as CPR, is an emergency procedure that involves chest compression to manually pump the heart and circulate blood to preserve intact brain function until further measures are taken to restore spontaneous blood circulation and breathing in a person who is in cardiac arrest. According to the International Liaison Committee on Resuscitation guidelines, CPR for adults involves chest compressions for adults between 5 cm (2.0 in) and 6 cm (2.4 in) deep and at a rate of at least 100 to 120 per minute. Sometimes it helps to use the rhythm of the song “Stayin’ Alive” as a guide to how fast you should pump. Unfortunately, only one-third (32%) of cardiac arrest victims receive bystander CPR and only 2% are treated with AEDs by bystanders. Do I have to do mouth to mouth? No, not in adults. The International Liaison Committee on Resuscitation guidelines on adult CPR no longer recommends mouth to mouth resuscitation. It is more important to keep pumping the heart with chest compressions. This is not always true in children however. The most important thing you can do for someone who looks like they have had a cardiac arrest is to start CPR. Even if you have never been trained, get down and start pumping on their chest. Do you have to be trained to do CPR? No. While we would highly recommend taking a CPR course, it is most important to just get down on your knees, clasp your hands together and push on the victim’s chest as hard and fast as you can. What if I think I broke the person's ribs? That’s okay – it probably means you were doing CPR properly ie. hard enough and deep enough. This is very common in elderly patients as their bones are often frailer. We say a victim would likely much rather live with a broken rib than not live at all! An Automated External Defibrillator (AED) or Public Access Defibrillator (PAD) is a portable user-friendly electronic device that automatically diagnoses potentially life-threatening heart rhythms. If the AED detects a problem that may respond positively to an electric shock, it permits a shock to be delivered to restore a normal heart rhythm. They are located in many public buildings, arenas, conference centres, malls, airports, casinos, etc and will have a sign indicating where they are. Yes, they are designed to be used by the lay public. You do not have to be trained or be a health professional to use an AED. AEDs provide simple audio and visual instructions from the moment you open the case. Some AEDs advise the operator to press a button to deliver the shock. Other AEDs automatically provide a shock if the heart is in a fatal rhythm. Can a rescuer hurt themselves or others with an AED? No, not if the AED is used properly. The therapeutic shock is programmed to go from one electrode pad to the other through the victim’s chest. Basic precautions, such as not touching the victim during the shock, ensure the safety of rescuers and other bystanders. The victim will most certainly die. For every minute that a victim is not resuscitated, their chances of survival drops by 10%. This graph shows the decrease in survival by minute with and without intervention. Can I be sued for doing CPR? The overwhelming majority of North American jurisdictions afford some type of legal liability protection for responders and AED users. Often, these protections are provided by things like the Good Samaritan act. Typically, responders are protected from liability so long as they act in a reasonable and rational manner. Liability protections generally don’t cover gross negligence or willful or wanton misconduct, such as consciously seeking to injure the patient or using an AED in a non-accepted, non-standard way. Can I find out what happened to the person? Unfortunately due to current privacy legislation it is very difficult to connect bystanders and victims. We are working on this as we think it is very important for bystanders to know how their response helped a victim and their family. Why did the Paramedics stop doing CPR? In some cases where the victim has been unconscious for a significant amount of time and there are medical indications that they will not be able to be resuscitated before going to the hospital the attending Paramedics may use a tool called the “Termination of Resuscitation Rule” to determine whether they should continue CPR. This tool has been extensively studied around the world and shown to be very accurate. This is a very difficult decision for Paramedics but they do it with the best interest of the victim and family in mind. What happens to patients after they are taken to Hospital? Subsequent care by healthcare professionals in the hospital Emergency Department and Intensive Care Unit (ICU) includes administration of medications and other advanced cardiac life support techniques. In patients who have been successfully resuscitated, mild therapeutic hypothermia (cooling of the brain) can improve the chances of survival with good brain function. Survivors often spend quite a bit of time in the intensive care unit and may attend rehabilitation therapy after they are discharged from the hospital. Sudden cardiac arrest survivors are often followed up by heart specialists (cardiologists and electrophysiologists). Many survivors undergo surgery to implant a device in their chests called an implantable cardioverter defibrillator (ICD) that can automatically deliver a shock to their heart should they suffer a cardiac arrest again. What happens to bystanders after the event? Witnessing or responding to victim of cardiac arrest can be a very traumatic event in a person’s life. Unfortunately we have not focused a lot of attention on understanding what this experience is like but we do know that it can be quite common for bystanders to experience stress, anxiety, sleeplessness, fear and personality changes. The Bystander Support Network was developed to help connect bystanders who may be experiencing these symptoms or simply want more information and to allow us to learn more from them about how we can help. Click here to learn more about the research underway and how you can to get involved or share your story Click here.